The lines between journalism and public relations keep getting blurrier. Not long ago, when news came from newspapers and network television, there were journalists and public relations people and very little in between. Those who worked for the team had one job: to promote the team. Those who covered the team strove for honesty and independence (in theory, at least). But now, thanks to proliferation of team- and league-produced media, the gray area between independent reporter and team shill is essentially infinite. And that brings us to Scott Burnside, the longtime hockey reporter who was fired from ESPN in April as part of a wave of layoffs. On Thursday, Burnside announced that he has a new job lined up not with another media outlet but with an NHL team, the Dallas Stars. As “senior digital correspondent,” he will write not only about the Stars but about the NHL at large, for the Stars’ official website. In his introductory post on the Stars’ site, Burnside explained the changing media landscape and called his job with the Stars, “an experiment.” He took great lengths to explain he won’t be doing PR for the Stars, he’ll be writing about the team as he sees it, good or bad. Beyond the stories of a team longing for a second championship, the Stars were looking for someone to tell the stories of the game, the League. There’ll be a podcast and lots of video, and maybe some television. Basically, they were looking for someone to do much of what I’ve been doing for the past 13 years or so at ESPN. The interesting part is team officials insisted – repeatedly – they weren’t looking for someone to shower the team in rose petals. As the former secretary of the Lambeth, Ontario 4-H Beef Club (this is true), the expectation is that if other material needs to be shoveled on the team beyond rose petals, that’s okay too. Burnside is certainly not the first journalist to go work for a team, but he’s one of the most prominent. And his hiring raises many thorny questions about editorial independence. Is Burnside, as a Stars employee, as independent as he was at ESPN? Almost certainly not. Then again, could you argue ESPN isn’t fully independent given that it has to maintain business relationships with the leagues it covers? Yes, you could. 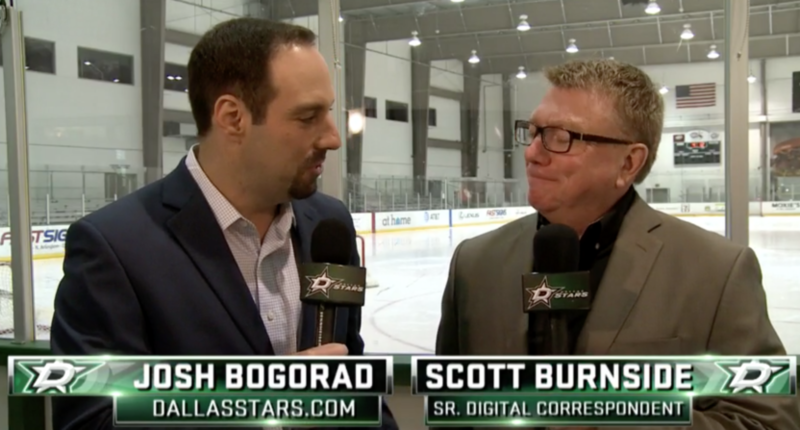 Will Burnside serve as a cheerleader for the Stars, like a PR employee? It doesn’t sound like it, but then again, he’ll be writing about the people who sign his paycheck. Is this different from league-owned media like MLB.com and NFL.com? In some ways yes, in some ways no—working for a specific team muddies the waters of objectivity. The point is, sports media in 2017 is complicated, with many blurred lines around the once-sacred principle of independence. And with traditional media outlets constantly downsizing, right as teams and leagues deciding they want in-house reporters to tell their stories, the lines could get even blurrier. The boom in team and league media is good news for writers who need to pay their mortgages. It could also be good news for fans who want high-quality content from quality reporters. It might be less good news for editorial independence. Scott Burnside won’t be the last big-name reporter to wind up working for a team he used to cover. Whether that’s for better or for worse, we’ll soon see.